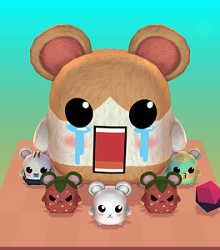 Too Crowded is a strategy game where the board moves backwards and forwards and you have to tap screen to drop the hamster onto the board. It’s harder than it looks because if you hit another hamster or rock that’s the end of the game. I believe these games are best for kids aged 5+. Another arcade game. Graphics are much advanced from the arcade style. It is not a game I would play for a long time however if you are thinking about games for the kids that are safe and need them to be stimulated, I would recommend this game.